Soak lemon size of tamrind in warm water and extract the juice from it. Heat Sesame oil in a pan, add mustard,cumin and methi seeds. Now add Sundakkai vathal and hing. Fry for few minutes. Its time to add Onion,curryleaves,garlic and fry till onion become transulent. Now, add turmeric powder, sambhar powder and coriander powder. Fry for few minutes and add tamrind juice to it. Add salt to it and let it boil. Boil until the gravy becomes thick. (May be for 10 minutes). Add sugar to increase the flavour and taste of gravy. Now, VathaKulambu is ready to serve. Sundakkai Vathal may be little bitter, so fry vathal in little oil and add it finally after adding salt. 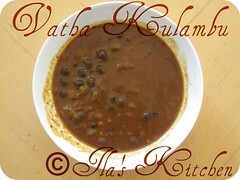 Spicy and delicious vathal kuzhambu. 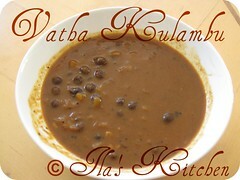 Looks like a spicy & tangy side-dish....however i cud not get what 'Sundakkai Vathal' means ?? Loved this gravy. Great preparation. Delicious and lovely kuzhambu..perfect with hot rice..
Spicy and delicious kuzhumbu..drool worthy. Tongue tickling n delish curry! Hey, I've never come across turkeyberry and now I'm intrigued. The curry looks super delicious!! wow...looks sensational..try your recipe soon..
Tongue tickling & delicious curry!!! I always love a spicy curry and yours make me want for some. spicy and mouth watering kolambu like it.. Thanks Ila for visiting my blog. My apologies for taking so long to get here. I had actually taken a sabbatical from my food blog and I am trying to catch up now. The dish sounds and looks delicious,I can never say no to anything cooked with tamarind and sambar powder I just love these flavors:)!!! I have added myself to your list of followers and look forward to more delicious recipes!!! Woww.. lovely and authentic recipe.. looks super tempting.. thanks for sharing ! !